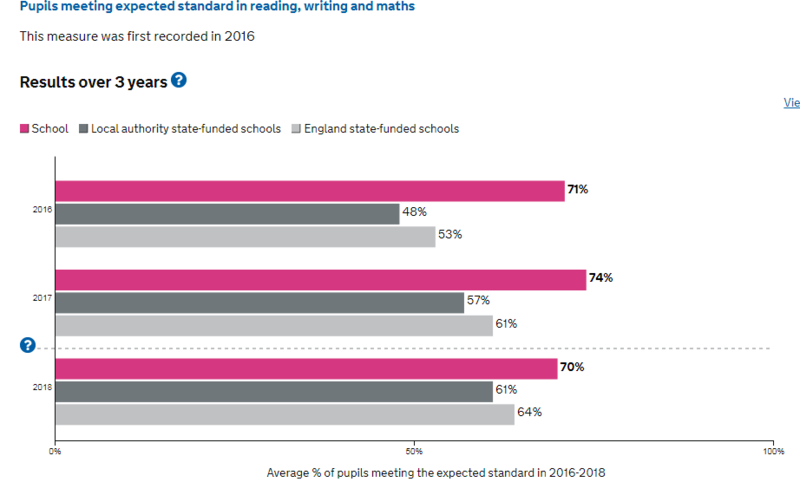 The charts below show the schools results from 2016-2018 for % of pupils meeting the expected standard and the higher standard by the end of Year 6 compared to other Worcestershire schools and national results. We are proud that alongside good results we are also able to offer a curriculum that is creative and engaging for our pupils. This page shows results data for pupils who completed key stage 2 (Year 6) SATs tests in the summer of 2018. These figures were published in December 2018. 2018/19 school improvement work in EYFS is focused on providing greater depth of challenge for our more able Nursery and Reception pupils . We will continue to build on the success of our writing curriculum to ensure this offers the best opportunities for our pupils. School has remained above the national phonic test outcomes from 2014 – 2017. In 2018 outcomes were impacted by a cohort specific dip due to a high proportion of summer born pupils and pupils with additional needs. The 2018/19 KS1 improvement focus priority is to ensure school is at least back in line with national outcomes in 2019. End of KS1 (Year 2) outcomes 2017/18 continue to be an improving picture. The KS2 school improvement priority is to improve progress in maths over key stage two to ensure a greater percentage of pupils achieve greater depth and also to improve outcomes at the expected level in spelling, punctuation and grammar.